The New Akiles CoilMac-ECP Plus Electric Coil Punching Machine is the premium version of the CoilMac-ECP. The CoilMac-ECP (+) line is designed for professional, convenient, fast and easy punching. It is equipped with heavy duty motor to insure flawless single punches up to 25 sheets of 20 lbs paper. The CoilMac is equipped with 4 depth margin control settings with easy alignment and punching for documents up to 26" long. What distinguishes The CoilMac-ECP Plus from the standard ECP is the addition function of all 54 pins can be independently pulled and disengaged for the perfect punch in any paper size. The CoilMac-ECP Plus is the first and only equipment to offer the additional special 4 x 5mm oval-shaped holes to make coil insertion much faster. With the additional upgrade of HD Electric coil Inserter, it will improve the coil binding speed by as much as 90% making one of the best electric coil binding machines on the market. Fully Disengageable Punch Pins: For a clean and professional punching of any paper size, all 54 pins can be independently pulled and disengaged. Oval Punching holes to help improve coil binding speed by as much as 90%. Heavy-Duty Punch Motor: Single punches up to 25 sheets of paper (20 lbs).. 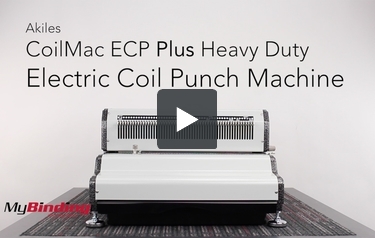 This is the Akiles CoilMac ECP Plus Heavy Duty Electric Coil Punch Machine. To start off using this machine, first plug in the power and the foot petal, then turn it on. Next, adjust the side margin control for correctly center punches. Pull out the appropriate adjustable dies for whichever sized page you are punching. Set your depth margin, select larger depths for thicker books. Here is the thickest and thinnest option. Then insert up to 20 pages at a time into the machine against the side margin control. Push the foot petal and the machine will make the punch. It's always best to do a test sheet first, because if the holes do not line up, you'll have to readjust everything again. You can punch longer pages too. After the first punch, flip the paper over, adjust the correct die piece. Then line up your page properly and insert the small knob on the right into the hole that lines up. Then finish off your punch. It's best to periodically change out the bottom waste tray so it doesn't fill too full. It comes with a coil diameter selector guide to match your page amount with the correct sized coil. It also comes with Coil cutting crimpers. When crimping, have the front facing you and the coil facing down. Crimp the extra coil off with the red dot on the crimpers facing you. Rotate the book and do the same. Please note that this machine does not insert coil. You will need either another machine or to do it by hand. And instead of crimping in the air, it may be best to place the book on a flat surface and do it. Lastly, there is a reverse button on the back if there is a paper jam. Do you carry coil spines for this machine? You can find the coils used by the Coilmac ECP41-Plus in our Coil Binding Supplies section on the site. We carry a ton of different colors and sizes. Just be sure to order 4:1 pitch.